How many times have we seen the corporate media report what seem to be blatant teasers of ET disclosure? Over the past five years, these media sources have continually hinted at revelations of non-terrestrial life, interstellar travel, and alternative Earth history. Yet, none of these mainstream sources ever openly state the significance of these disclosures or the profound truths which they reportedly have in common. Why? Many of those in the truth community already know about the existence of special access projects, advanced technology, and extra-planetary operations. We know of the existence of not only the various secret space programs, but of the possibility of numerous ET races being in contact with the personnel within these programs. To modern truth'ers, it has become clear that disclosure extends much farther than extraterrestrial life or alternative energy technology. However, the corporate media seems to have trouble even starting the conversation on these matters. The process known as soft disclosure has been taking place for decades now. This is the slow introduction of formally-hidden truths into the minds of the general public through corporate media. This process is typically accomplished using entertainment in order to communicate these concepts without disturbing the sense of normalcy of audience members. Yet it is only within the past five to ten years that this process of soft disclosure appears to have drastically accelerated. This quickening in the pace of disclosure seems to have a purpose behind it—a purpose which could be to initiate a more open and forthright discussion on the above matters which are presently treated as fiction. It does not take much effort to see the subjects of soft disclosure presented to us by mainstream media. These disclosures have come in a variety of subjects, but many of them cover the topic of the numerous discoveries of water-bearing exoplanets by NASA, both within our solar system and in distant systems in outer space. During the year 2015, there seemed to be dozens of disclosures coming forward about newly-discovered planets in some distant system which could possibly support life. Over and over again, NASA and various corporate sources produced these reports—all while hinting at the possibility of ET life which up until this point, has been blindly ridiculed by the scientific establishment as being completely invalid. Combined with these disclosures of exoplanets were the numerous discussions of an alternative history of the solar system. These came in the forms of Buzz Aldrin's talk about a monolith on the Martian moon, Phobos, as well as the stunning disclosure that Mars was once covered with oceans. Keep in mind that these concepts are being disclosed by established corporate sources. Also, just months before these reports took place, these concepts were simply laughed at and dismissed by the establishment. It wasn't a decade beforehand that it was basically decreed by the establishment that Mars had never housed life at all, and anyone who said otherwise was ridiculed. This has been the controlling climate of the Western scientific establishment for the last century. However, Western science seems to combine valid science with pseudo-science and dogmatic half-truths. Instead of true and open progress toward new scientific discovery, elitist interests have reportedly prevented the scientific establishment from progressing to any significant degree. This is said to be due to the elitists' desire to prevent the obsolescence of the present technological, corporate, and monetary establishments. Consequently, we the public have received manicured sideshow displays of what the financial powers behind science (as well as scientific publications) deem suitable for the public eye. Another NASA disclosure came with the mission of the space probe, Dawn, which was sent to explore the planetoid, Ceres. Part of the goal of the Dawn mission was to solve the mystery of the Ceres lights—two very bright, self-luminescent lights that were seen on the surface of the planetoid. However, NASA's publication on this issue seemed to fall short of any complete explanation. The Ceres disclosure seemed to only be another soft disclosure which was most likely intended to hint at other, more significant truths about the history of our solar system. To add, the explanation which NASA and other reporting sources offered made virtually no logical sense whatsoever, yet these explanation were published by multiple corporate media sources. Explanation such as "salt deposits" were handed to the public by corporate media—dismissing the facts that these lights were extremely luminous like stars in the sky. No salt I have ever seen gave off that much light unless it was physically exploding in some violent reaction, but that is not what we see from the Ceres planetoid. On Ceres we see two steady and extremely luminous light sources, and these have been dismissed by scientific publications with clearly unscientific explanations. It is substandard explanations such as this which make it more clear that the establishment is hiding some greater aspect of the truth from public view. So when we hear about an asteroid drifting through our solar system, we know the likelihood that there is more to the story. When we look at the shape of the proposed "asteroid" reported by NASA, we see something interesting. This shape seems very similar to the classic cigar-shaped UFOs many have reported seeing on Earth. This shape is also similar to one of the ship configurations which the late William Tompkins testified to designing. Tompkins was a child prodigy in technical drawing and was drafted by the U.S. Navy at a very early age. 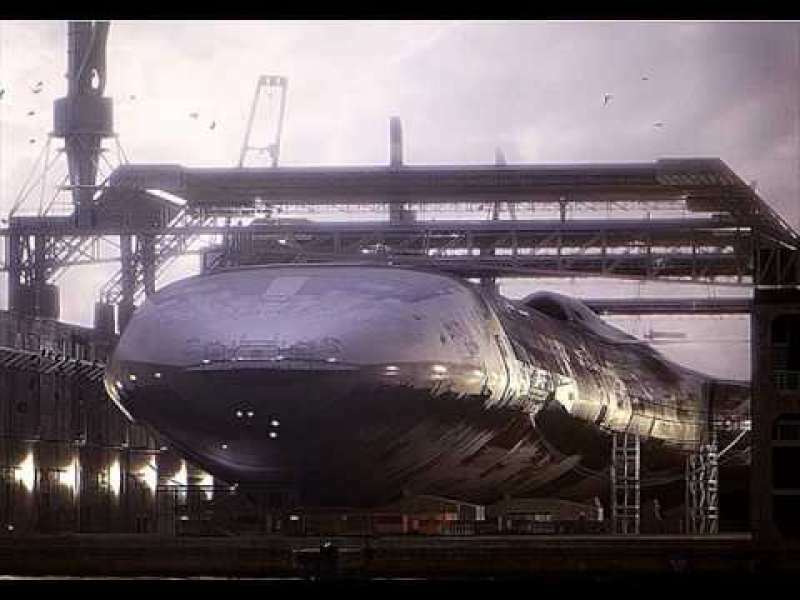 While serving, he was commissioned to design ships and space carriers for interplanetary and interstellar travel. It could very well be that this supposed asteroid discovered by NASA is yet another attempt by corporate media to preface the narrative of some "new discovery" of advanced technology or ET life. The media might claim that the asteroid has microbial life from another star system. They might also say that it has ruins on it or that it contains signs of intelligent life. 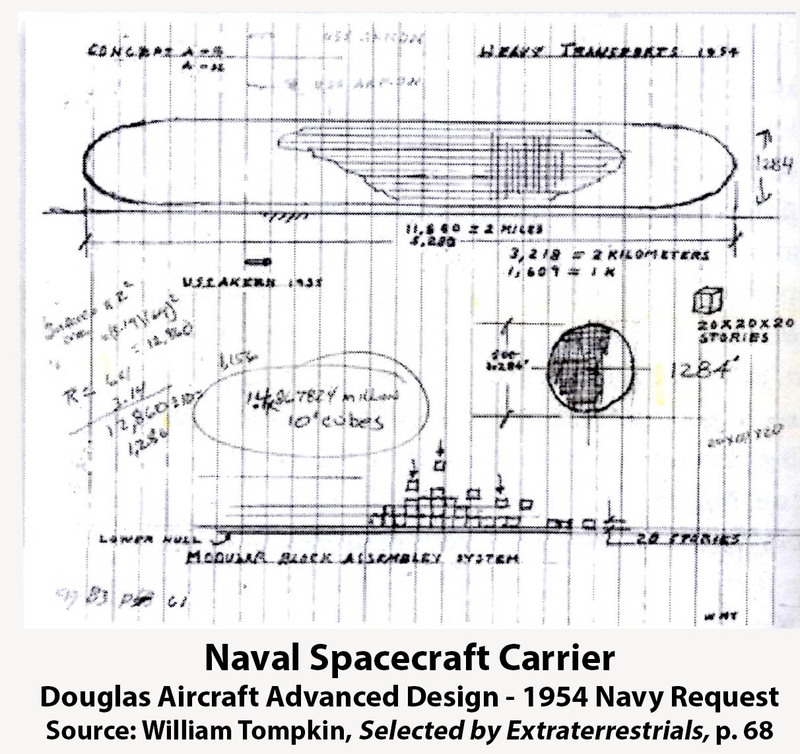 It may even be that this object is actually one of Tompkins' space carrier designs which is deliberately being misrepresented by the median until an opportune time. Some sources believe that NASA may be using this news in order to position themselves to disclosure interstellar travel at some point in the near future. The consistent mentioning of concepts of ET life, UFOs, and alternative version of Earth history make it likely that the testimonies of many whistleblowers were valid. These testimonies spoke of slow disclosure efforts by corporate media to acclimate the general public to the truth which had been kept hidden until now. The powers behind media have maintain secrecy for all of this time, but have also rationed out various half-truths in news and entertainment in an effort to soften the blow of bigger disclosures. It seems from the intensity of efforts by certain parties to silence those who promote complete disclosure, that some organizations are still interested in maintaining secrecy to some degree. These interest may be attempting to maintain their own financial superiority over the rest of humanity. They may also be attempting to hide their own crimes against humanity which they have committed under the cover of secrecy. According to reports, both of these cases apply. A complete and thorough disclosure would bring an end to the exploitation of the human race by wealthy elitists. It would also require the entirety of the past actions of these elitists to be exposed so that we know how to stop other parties from possibly doing the same in the future. A full disclosure would reveal the truth behind free energy, interplanetary and interstellar travel, stop human trafficking, and it would open the door for contact with other non-terrestrial races. Most of all, a complete disclosure would mean the liberation of the planet from debt slavery and exploitation by greedy elitists. If knowledge is truly power, then our learning is directly proportional to the degree of liberation we will achieve upon disclosure. This gives us a new look at the slow and insubstantial disclosures which NASA divvies once every few months. We could continue to put up with this censorship for a years on end, but I think we can all agree that most of us are ready for something more. 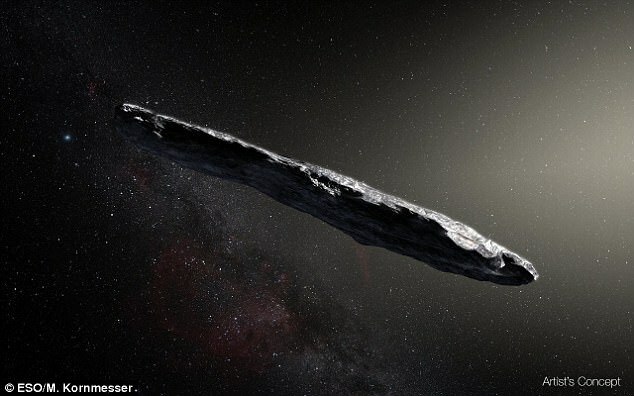 A newly discovered object from another star system that's passing through ours is shaped like a giant cigar with a reddish hue, astronomers have revealed. The asteroid, named 'Oumuamua by its discoverers, is up to one-quarter mile (400 meters) long and highly-elongated - perhaps 10 times as long as it is wide. That aspect ratio is greater than that of any asteroid or comet observed in our solar system to date. The asteroid, named ‘Oumuamua by its discoverers, is up to one-quarter mile (400 meters) long and highly-elongated—perhaps 10 times as long as it is wide. Most comets follow ellipse-shaped orbits around the sun. But this comet appears to orbit at an angle, and doesn't circle the sun. Its orbital path suggests it entered our solar system from the direction of the constellation Lyra, looped around the sun, and will never return. But others have suggested that the comet did come from Earth, but interacted with Jupiter or another planet, which changed its orbit. While its elongated shape is quite surprising, and unlike asteroids seen in our solar system, it may provide new clues into how other solar systems formed. The observations and analyses were funded in part by NASA and appear in the Nov. 20 issue of the journal Nature. They suggest this unusual object had been wandering through the Milky Way, unattached to any star system, for hundreds of millions of years before its chance encounter with our star system. 'For decades we've theorized that such interstellar objects are out there, and now – for the first time – we have direct evidence they exist,' said Thomas Zurbuchen, associate administrator for NASA's Science Mission Directorate in Washington. Combining the images from the FORS instrument on the ESO telescope using four different filters with those of other large telescopes, a team of astronomers led by Karen Meech of the Institute for Astronomy in Hawaii found that 'Oumuamua varies in brightness by a factor of ten as it spins on its axis every 7.3 hours. No known asteroid or comet from our solar system varies so widely in brightness, with such a large ratio between length and width. The most elongated objects we have seen to date are no more than three times longer than they are wide. 'This unusually big variation in brightness means that the object is highly elongated: about ten times as long as it is wide, with a complex, convoluted shape,' said Meech. 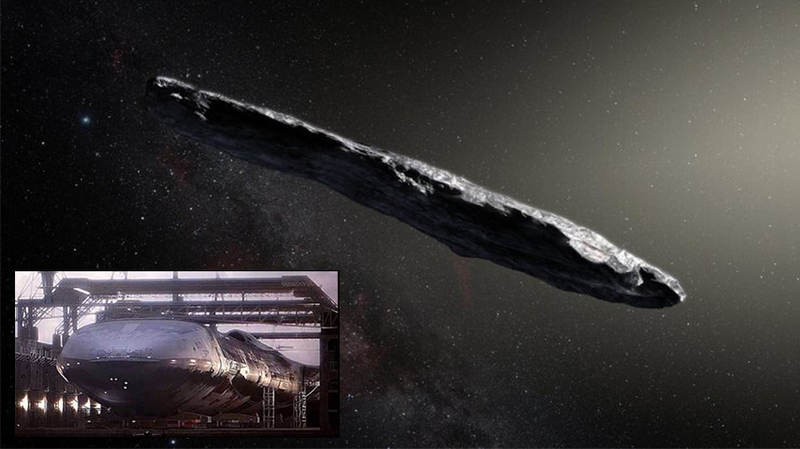 These properties suggest that 'Oumuamua is dense, comprised of rock and possibly metals, has no water or ice, and that its surface was reddened due to the effects of irradiation from cosmic rays over hundreds of millions of years. Scientists are certain this asteroid or comet originated outside our solar system. First spotted last month by the Pan-STARRS telescope in Hawaii, it will stick around for another few years before departing our sun's neighborhood. Jewitt and his international team observed the object for five nights in late October using the Nordic Optical Telescope in the Canary Islands and the Kitt Peak National Observatory near Tucson, Arizona. At approximately 100 feet by 100 feet by 600 feet (30 meters buy 30 meters by 180 meters), the object has proportions roughly similar to a fire extinguisher — though not nearly as red, Jewitt said Thursday. A few large ground-based telescopes continue to track the asteroid, though it's rapidly fading as it recedes from our planet. Two of NASA's space telescopes (Hubble and Spitzer) are tracking the object the week of Nov. 20. As of Nov. 20, 'Oumuamua is travelling about 85,700 miles per hour (38.3 kilometers per second) relative to the Sun. Its location is approximately 124 million miles (200 million kilometers) from Earth -- the distance between Mars and Jupiter – though its outbound path is about 20 degrees above the plane of planets that orbit the Sun. The object passed Mars's orbit around Nov. 1 and will pass Jupiter's orbit in May of 2018. It will travel beyond Saturn's orbit in January 2019; as it leaves our solar system, 'Oumuamua will head for the constellation Pegasus. The slightly red hue — specifically pale pink — and varying brightness are remarkably similar to asteroids in our own solar system, he noted. The object is so faint and so fast - it's zooming through the solar system at 40,000 mph (64,000 kph) - it's unlikely amateur astronomers will see it. In a paper to the Astrophysical Journal Letters, the scientists report that our solar system could be packed with 10,000 such interstellar travelers at any given time. It takes 10 years to cross our solar system, providing plenty of future viewing opportunities, the scientists said. Trillions of objects from other star systems could have passed our way over the eons, according to Jewitt. It suggests our solar system ejected its own share of asteroids and comets as the large outer planets — Jupiter, Saturn, Neptune — formed. Why did it take so long to nail the first interstellar wanderer? 'Space is big and our eyes are weak,' Jewitt explained via email. First spotted last month, it will stick around for another few years before departing our sun's neighborhood. The International Astronomical Union, meanwhile, has approved a new designation for cosmic interlopers like this one. They get an 'I' for interstellar in their string of letters and numbers. The group has also approved a name for this object: Oumuamua, which in Hawaiian means a messenger from afar arriving first. The comet, called C/2017 U1 was spotted by a telescope in Hawaii on 18 October, and was then seen 34 separate times in the week after. While most comets follow ellipse-shaped orbits around the sun, this comet appears to orbit at an angle, and doesn't circle the sun. 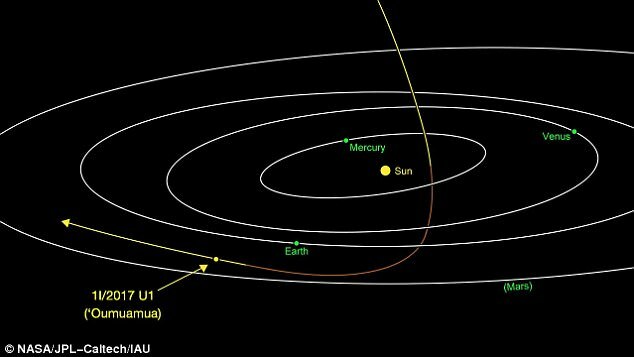 Rob Weryk, a postdoctoral researcher at the University of Hawaii Institute for Astronomy (IfA), was first to identify the moving object and submit it to the Minor Planet Center. Weryk subsequently searched the Pan-STARRS image archive and found it also was in images taken the previous night, but was not initially identified by the moving object processing. Weryk immediately realized this was an unusual object. 'Its motion could not be explained using either a normal solar system asteroid or comet orbit,' he said. Weryk contacted IfA graduate Marco Micheli, who had the same realization using his own follow-up images taken at the European Space Agency's telescope on Tenerife in the Canary Islands. 'This is the most extreme orbit I have ever seen,' said Davide Farnocchia, a scientist at NASA's Center for Near-Earth Object Studies (CNEOS) at the agency's Jet Propulsion Laboratory in Pasadena, California. The CNEOS team plotted the object's current trajectory and even looked into its future. A/2017 U1 came from the direction of the constellation Lyra, cruising through interstellar space at a brisk clip of 15.8 miles (25.5 kilometers) per second. 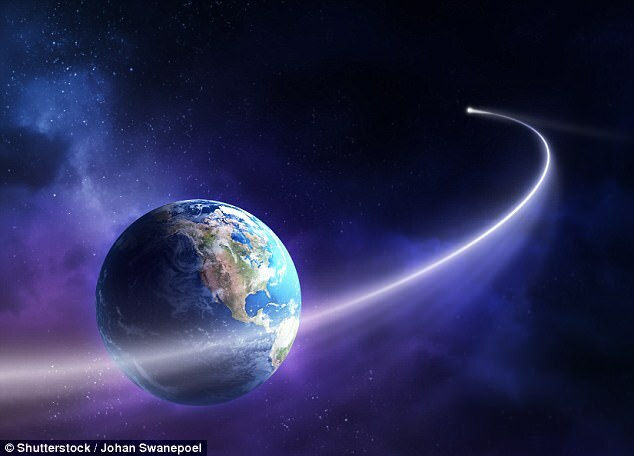 Observations published by the International Astronomical Union's Minor Planet Centre (MPC) suggest the comet likely escaped the orbit of another star. The MPC said: 'Unless there are serious problems with much of the astrometry listed below, strongly hyperbolic orbits are the only viable solutions.